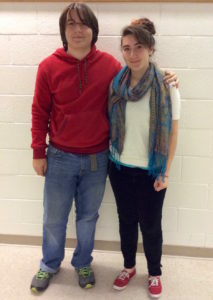 Steller students, Bella L and Sebastien L, have been accepted to the 2016 ASAA All-State Band and Orchestra. Bella, a senior flautist, and Sebastien, a freshman trumpeter, competed, through audition process, among the most talented high school musicians in state, to earn the spots in the prestigious student ensembles. “For Bella, she has made the All-State Band and Orchestra for four straight years, and that is an accomplishment that only a few high school students may achieve,” said, Mr. Toba, the band director. “I can not find a word to describe how proud I am of Bella.” “Sebastien is only a 9th grader, and he has already made BOTH the All-State and Orchestra, which is quite an accomplishment. He has three more years to even get better with his playing,” Mr. Toba added. The All State Band and Orchestra will have a gala concert on Saturday, November 18 in the West High School Auditorium, at 6 p.m. Admission will be 10 dollars for adults, 5 dollars for students. Public is invited. This entry was posted in Events, Student Accomplishments by david wike. Bookmark the permalink.